Quadrille (Eau de Toilette) is a popular perfume by Balenciaga for women and was released in 1950. The scent is spicy-chypre. The production was apparently discontinued. 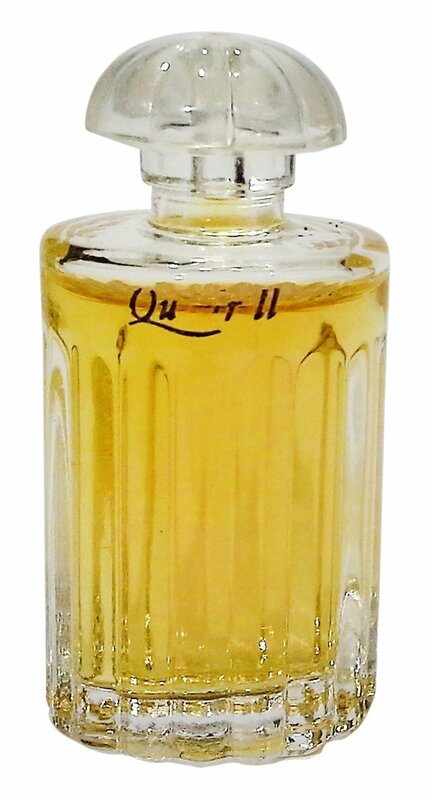 *This is a review of the original formula vintage Quadrille EdT. Quadrille (vintage) opens with a nose tingling blast of deep, boozy plum wine with significant musk and mossy green oakmoss support. Moving to the early heart the boozy plum recedes to a supporting role, leaving the animalic musk and mossy green oakmoss as co-stars with hints of dulled peach fruit and cardamom spice. As the composition moves further through its mid-section, the musk fades as the oakmoss switches gear, now featuring its powdery facet while maintaining some of its prior mossy green nature. During the late dry-down the composition stays linear with the gentle powdery oakmoss remaining almost through the finish, as hints of earlier obscured jasmine show up towards the end of the composition's development. Projection is excellent, as is longevity at well over 12 hours on skin. Balenciaga has a fine history of releasing outstanding compositions, and vintage Quadrille shows off what the house can do at its best. The opening boozy plum wine assault is extremely intense and I loved every minute of it. Adding to the opening barrage is the musky oakmoss that melds perfectly with the boozy plum, amplifying its impact and depth, while ratcheting up the brilliance factor exponentially. The composition then impressively shifts gears from its boozy open to a more green powdery oakmoss led accord with the animalic musk playing co-star. I am not a huge powder fan, but the powder level never gets out of hand, and the mossy green facet of the oakmoss somehow holds things together throughout. The last surprise well after the composition was little more than a skin scent was when a fine, slightly sweet jasmine emerged right at the end of the composition's life cycle, and it is one of the best jasmine notes I have ever sniffed. How the jasmine was hidden for most of the development is a mystery, but smelling it at the end made for a very fine finish indeed. Quadrille (vintage) is the kind of composition that makes one really long for the "good old days" where IFRA regulations and focus group testing weren't the rage. Yes, it smells like it is from another age, but by saying that I mean it with the highest respect and compliment. They just don't make 'em like they used to. The bottom line is Quadrille (vintage) checks off all the boxes as to what makes a perfume classic and great, earning a "near masterpiece" rating of 4.5 stars out of 5 and a strong recommendation to vintage perfume lovers of either gender. Write the first Review for Quadrille (Eau de Toilette)!